Two girls from Austin share a few spunky summer tunes. Messy hair, neon colored tights, water balloons, jump ropes, ice cold lemonade – this is what you can expect from Austin's GALPALS in their music video for infectiously catchy song "For Our Sake." Directed by Cassandra Lee Hamilton, the footage is the perfect match for such a spunky summer tune. In fact, the duo, comprised of Lauren Marie Mikus and Jillian Talley, refused to slow down throughout. Sunny harmonies bounced over quick percussion and made this nearly impossible not to dance to. "For Our Sake" is one of three tracks that appear on the girls' 7" now out via UK-based Howling Owl Records. The other two b-sides "Do You Ever" and "Dilettante" are just as memorable. "Do You Ever" is a song that we've heard before and even included on our School Sux Monday Mix (here) because it reminded us of teenage rebellion. With poppy hooks and lyrics like "do you think you could ever wake up before noon / think that you could tidy up your room?" this would be perfect on the soundtrack of My-So Called Life, Freaks and Geeks, or any other 90s show about high school. Last but certainly not least, "Dilettante" is a demo that we hadn't heard previously. Just as lightning fast as the tracks before it, "Dilettante" is the grungiest of the three; scuzzy sha-la-la's remind us that we're not young forever so it really is "now or never." Live fast, die young, and listen to GALPALS somewhere in between. 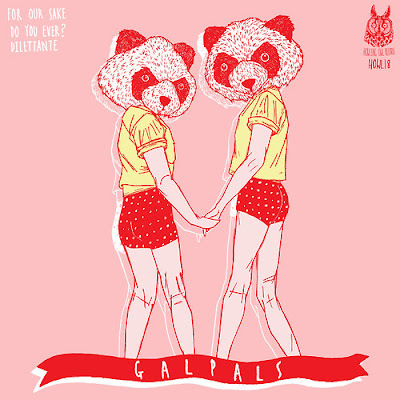 Buy GALPALS' For Our Sake 7" at Howling Owl Records.